Yesterday I spent way too much money. I went to the shop to buy some plastic wallets for my current project on Bursts of Bubbles and ended up buying all of this instead. The tickets I had looked up on eBay because I wanted some for one of the envelopes I was making and have used them in the past on something else but it was £10+ a roll. If I wanted a couple of colours it would have worked out too expensive so I didn't get any at all and made my own. Then yesterday when I saw that rubber stamp set I had to get it even though I hate things with words on. I can however use my pro markers to go around the outline so can miss the words out. I really hate some of the wording as you can only use them for a partner which limits it so why do it? Those stamps by the way cost me £6. I then came across those frame rubber stamps which I whipped up straight away as they were only £2.50 and I've already made good use of them on my envelopes, I love them! There was another set but that had words to go with it so you didn't get as many frames as this one as this has a frame within a frame. I then went to the craft shop in the city to buy some pro markers only like an idiot I left my little chart at home of the colours I needed so only picked up these 2. 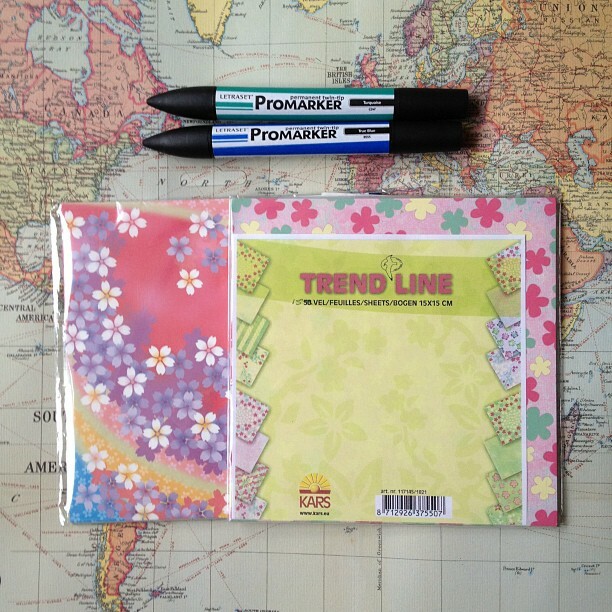 Before I even got to the markers I came across these origami sheets which I had to get as I really wanted some more but the website that I ordered my batch from years ago seems to have disappeared and no where else seems to sell a great variety as them. It may still exist but my last laptop went haywire and I lost everything which is why I thought I'd saved all my banners, buttons etc... and couldn't understand why I couldn't find all of them... thankfully I eventually did. I bought 2 of these from Primarks yesterday for £3 each... I couldn't believe my luck as they were on for £7. 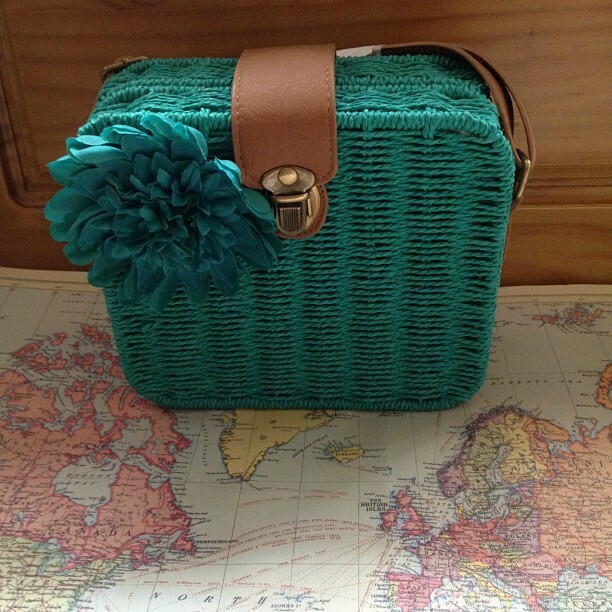 I am one day going to buy myself the bigger one which is double the size of this as it would fit so many of my letter writing things in and I can write more often downstairs. At the moment its on for £12 and with having spent so much already I couldn't bring myself to spend anymore on myself. I'd also bought some cartridges for my calligraphy pens but they still won't work properly :(. One I bought for the daughter of someone I used to work with, this teacher is having a year out to do other things so I thought I'd give them both a little something as her mum would truly appreciate it. I'm thinking of filling it with little bits and pieces but I've no idea what yet. Maybe you have some suggestions what a girl of around 8-9 years will like? This is the left overs of a take away we had last night. My older brother told us to get one each as there wouldn't be enough to share. I didn't even get half of it eaten and was full as it had the most amazing super chunky chips too... now a days take aways only sell fries. I've never had this before, its like a pizza with a twist. The base is chicken covered in bread crumbs, I've no idea how many chickens they would have used to get it to the size it was as it was the size of half a pizza. It was then baked with cheese and peppers on top. 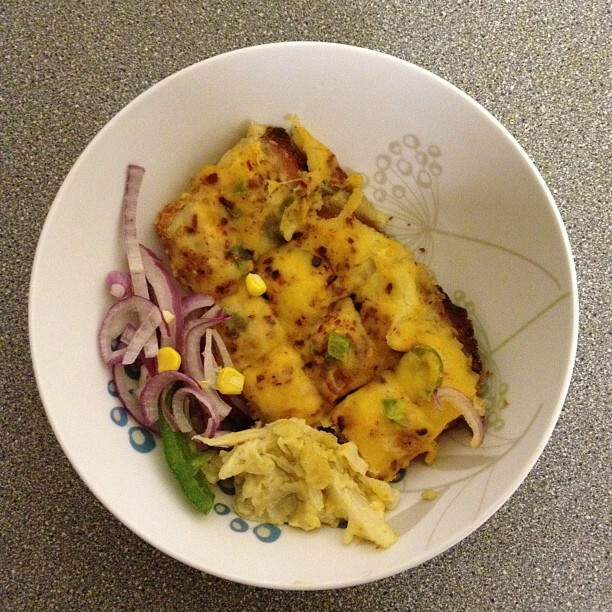 On the side it had an onion, sweetcorn and pepper salad with cheesy cabbage. It was really nice and super filling. My younger brother choose 2 of these and for my mum and sister they had a bologneses topping which I tried a square of and actually liked more as the tomato paste left a tangy taste. I still need to pay my brother for this! Its the first chicken type thing that I truly liked as usually they are too chunky with squidgy bits in that I hate. Love "crafty" things! I spent about £35 on paper, stamps and paint pads last night. There doesn't seem to be a lot of paper though, and I tend to go through stuff like crazy! What would I do without Amazon? I know when buying craft supplies, money seems to be spent like its coming out of a tap, its quite disappointing when you don't end up with a huge bag full at the end. I don't tend to use paper as much so find I end up with too much and it has too many sheets for me which is why I have to stop myself buying more. Its something I thought about was crafty things from tescos as they have some nice elegant ranges. I'll have to see if I get time during the week. Craft shops do tend to get really pricey don't they, and I know I always come out with more than I needed in the first place. I went to a craft shop today and found those tickets stamps so was really pleased - I'm just cutting out the words now as I wouldn't use them either! What paper do you find responds well to the pro markers, they bleed through everything I have tried them on? Its quite terrible the amount we can spend on things that look pleasant to the eyes which is why I'm trying to be more careful in what I buy as I would end up buying a lot of papers, paper flowers and buttons. My rooms such a tip due to having too many hobbies but hopefully one day I'll get to have a craft room and organise everything properly. I'm guessing they will work really well on oil painting paper but it would be too thick. I was a little annoyed when I first used them as the lady at the craft store told me they were the right thing to use for colouring in stamped images but like you said they bleed and actually bleed over stamped lines or blur them. I've got used to them now and tend to stick the images down anyway. I've never tried stamping with them so when I use these it will be the first time. I would also add crafting bits and pieces to the basket, maybe also a little stuffed animal or a small book? You use a plastic block to stick it to as the rubberstamp is clingy. Its actually much better and you can see exactly where you are stamping. So do you have to have a plastic block for each rubberstamp or can you change them? 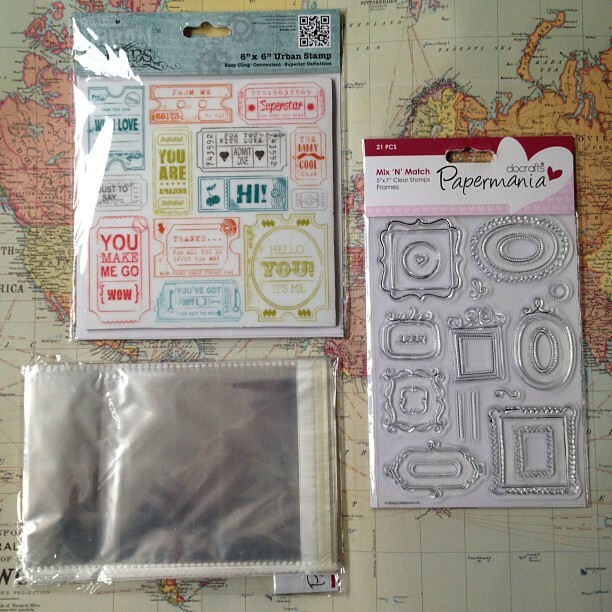 In each pack of these rubberstamps is a plastic sheets to stick the stamps between so you just need to buy blocks in the sizes you feel comfortable with. Some even have blocks with them. I have one big block and use it for all sizes. I bet you'd be really good if you made something but I also understand people don't want to go down that road of taking up another hobby as it can get so expensive too. I guess I'm really encouraging about it as I didn't even know I could papercraft. It came by chance when a friend had the owner of a yahoo group send me an invite. I don't think people thought my FBs were neat enough (or what is now High Quality). The owner eventually got really friendly with me and sent me loads of supplies which gradually became what I do today and we are now writing all these years later. Its one of the reasons I've gone back to setting myself a project a month in order to get back into trying new things and experimenting. I know, mostly though I now have to think if I really need it as my bedroom is creeking from all my mail supplies, craft supplies and house hold items.